Can I recharge my A/C system myself? YES! This is one of the easiest jobs that you can do yourself on your vehicle. If you’d like to see how simple and easy the process is, please head on over to our video section to watch our how-to videos. And as always, if you have any questions, please feel free to call our customer support line at 888-318-5454 for assistance. Why do I need to wear gloves when adding refrigerant? You need to wear gloves for a couple of reasons. First, as you release refrigerant from the can into your vehicle's A/C system, the can will become very cold to the touch. In addition, you are working around the vehicle as it is running, and there will be hot surfaces that could possibly burn you. So in order to protect your hands from the cold can and possible burns, it is always recommended that you wear cloth-lined gloves, and don’t forget your safety eyewear. I keep having to add refrigerant. Where did it go? If you are constantly adding refrigerant to your system, you have a leak. If your car is more than five years old, then chances are that the O-rings and gaskets have become brittle and inelastic, causing small leaks throughout the system. Adding a refrigerant with a leak sealer and O-ring conditioner will help to correct this problem. Is an overcharged system dangerous? Not only is overcharging your system potentially dangerous, an overcharged system will not function properly and can seriously damage your A/C compressor or other component parts. The symptom of an overcharged A/C system is exactly the same as a system that is undercharged: warm air coming out of the vents. In order to prevent overcharging your A/C system, it is imperative that you measure the pressure before beginning to charge it. To measure the pressure in the A/C system, attach a pressure gauge to the low-side port. 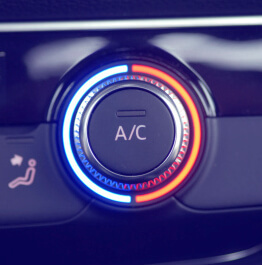 Your car must be running with the A/C system set to maximum cool and the fan at its highest setting. It is important to note that the proper pressure in your A/C system is dependent on the ambient (outside) temperature. To determine the proper pressure for your system, consult a pressure chart, or set the bezel arrow on your pressure gauge to the corresponding ambient temperature and charge to the pressure corresponding to that temperature setting. If the outside temperature is at or below 55°F, do not charge your car. Also, never charge your vehicle above 55 psi. My pressures are correct, but I am still getting warm air from the vents. Why? There are a number of possibilities. Your compressor may be damaged and not working properly. You can check to see if it is cycling on and off properly by looking at the clutch faceplate in the middle of the compressor pulley. Watch this video of a compressor that is cycling on and off properly. If your compressor is not cycling on, then you should seek the help of an A/C professional immediately. Ignoring the problem will not make it go away and, in fact, it could make matters worse. Other possible causes are blown relays and fuses, defective sensors or a stuck blend door. Seek the help of an A/C professional to assist you in determining the cause in your particular case. Why does my gauge go into the red/high-pressure area? The most common reasons for the pressure gauge to indicate a red/high-pressure reading are the car is not running, or the A/C is not on with the fan switch set to high and the temperature at its coldest setting. In order to obtain an accurate pressure reading, the car must be running, the A/C set to the coldest position and the fan set to high. Also, as the car’s compressor cycles on and off, the needle on the gauge will move in and out of the red/high-pressure area of the gauge. This is normal. Watch this video to see an example of a car compressor cycling on and off. Can I just vent the refrigerant if it is overcharged? No. Not only is it harmful to the environment to vent refrigerant into the atmosphere, it is also illegal. Violation of this federal law may carry a fine of up to $25,000. If you need to recover refrigerant from your system, please seek the help of a qualified service technician. When you overcharge your system, a pressure cut-off switch is activated to stop your A/C compressor from running. This, in turn, will cause your system to blow warm air. If this happens, you will need to go to a certified professional and have the excess refrigerant recovered from your system. Remember, it is illegal to vent refrigerant from your system, and the government can impose stiff fines for failure to follow these rules. How do I locate my low-pressure service valve? The low-pressure service valve (sometimes called the low-side port) is located in the line that runs from the compressor through the evaporator (firewall) and up to the condenser on the low-pressure (suction) side of the system. R-134a recharge hoses will fit only on the low-pressure service valve on all R-134a vehicles and R-12 vehicles that have been converted to R-134a. If you don’t know where your low-pressure port is, you can try using our low-pressure port locator. Your system should be vacuumed if you have replaced a component part in the system, or if the pressure gauge indicates that the A/C system pressure is lower than 10 psi. I get two pressure readings while checking my low-side pressure. Which one should I use? When checking low-side pressure, you will get two different pressure readings, one when the compressor cycles on and one when the compressor cycles off. Use the pressure reading when the compressor is cycled on and the system is operating at its highest settings (temp to MAX cold and fan on high). When the compressor cycles on, you should see the needle on your pressure gauge begin to drop. When the compressor turns off, you will see the needle move back to a higher pressure. Take the reading that occurs when the pressure is at its lowest point, when the compressor is cycled on. To tell if your compressor is cycling properly, take a look at this following video. What is ambient temperature, and what should my pressure readings be? Ambient temperature is simply the temperature of the air surrounding the car. For instance, if the ambient temperature (outdoor temperature) is 75°F, the corresponding low-side pressure should be between 35–45 psi and if needed, the corresponding high-side pressure would be between 150–170 psi. Our automotive A/C chart outlines the proper pressure readings for a particular temperature range. How will I know when I should stop charging my system? Dispense refrigerant gas in 15 second increments, and check pressure and vent temperature at each interval. You should expect to hold the charging lever in for a total of at least one minute to get approximately one 12-ounce can installed (outside temperature and vehicle condition will affect this time).